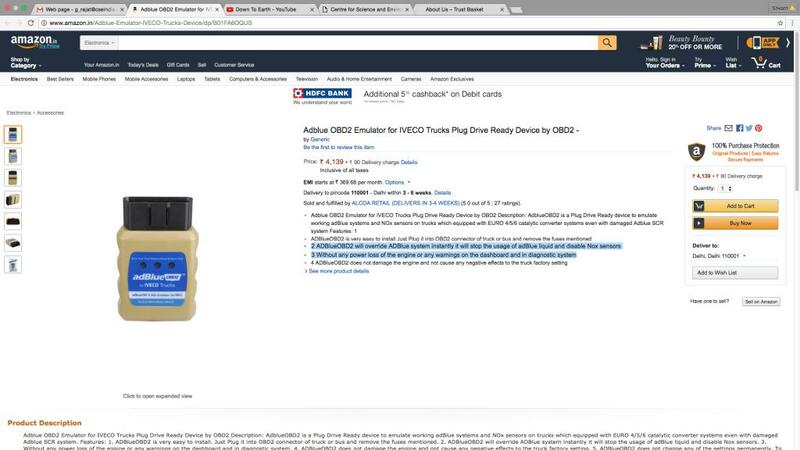 I was shocked when I saw the shopping list of Amazon, the largest Internet-based retailer in the world, flaunting a product called “Adblue OBD2 Emulator for Trucks Plug Drive Ready Device by OBD2”. A lay person should know that this is a defeat device that disables the emissions control system for nitrogen oxide in diesel vehicles. Adblue is a urea-based solution that is regularly filled in the Selective Catalytic Reduction (SCR) system attached to the exhaust of the modern diesel vehicles to control nitrogen oxide (NOx) emissions. As regular refill is a recurring cost for the consumer, these dubious and illegal devices that are flooding the global market tempt the customers to disable the SCR system. If this practice is not stopped immediately, it will only result in uncontrolled NOx emissions leading to serious ozone build-up and damaging health consequences. Such unethical marketing of defeat devices is appalling. To claim that such devices exist for open sale to disable emissions control systems in vehicles should be illegal, regardless of the fact whether countries have specific laws against them. SCR is the most dominant approach to control NOx from diesel vehicles meeting emissions standards of Euro IV, V and VI. If these systems are disabled, NOx emissions will be uncontrolled—as bad as Euro 0. India will have to wake up right now to put in place regulations to prevent use of defeat devices by people and manufacturers to cheat emissions regulations. Indian vehicle manufacturers have already started installing SCR systems in Euro IV diesel buses to control NOx and this application will expand quickly to other diesel segments when Euro IV emissions standards become uniform across the country in 2017 and Euro VI is implemented in 2020. India, which is in the grip of severe pollution, cannot afford deliberate compromises of on-road emissions performance of vehicles. Already, there are scary evidences from Latin America—countries like Brazil show only 46 per cent of the diesel vehicles that are fitted with SCR systems have working SCRs and the rest have been disabled. When I checked out the companies selling these devices on Amazon, companies like Cardiag showed up without much detail about them on the website. They claim to have developed AdBlue Emulator V4 NOx installation manual and customised them for major truck brands like Iveco, Mann, Renault etc. Cardiag gives a graphic description to truck users on how to use these devices in Iveco trucks for instance, to disable the SCR. It states, “AdBlue emulator connection on Iveco Eurocargo trucks requires the same steps but you need to remove SCR (AdBlue) pump fuse from the fuse box located near the battery of the truck.….Fuse, which must be removed is in the box beside the battery case. This is the fifth fuse from the left marked as UDS. After the installation of the emulator, there should not be any errors displayed. Also, AdBlue fluid level should be displayed at 75-100 per cent level.” Similar information has been provided for other brands like Mann and Renault. Does this therefore mean that their devices can reconfigure systems of the vehicle in such a manner that the on-board diagnostic system that is supposed to track and alert the AdBlue content of the SCR tank will no longer do so but will continue to display that the AdBlue tank is filled to the desired level of 75-100 per cent, and thus escape detection and legal compliance? First of all, markets that have not yet enforced Euro IV emissions standards will not have vehicles with SCR systems to be disabled. What the company is claiming may apply to some limited situations in developing countries as in the African region where used vehicles are imported from the US, Europe and Japan. But for these vehicles, dealers and manufacturers will have to take the responsibility of ensuring that appropriate emission-control systems are adapted or retro-fitted as per the local regulations. The vehicle-importing countries as well as appropriate regional and global trade forums will have to work out appropriate legal framework for such trade. While the company may have absolved themselves by claiming that “Our product is oriented to countries where there are no laws requiring EURO 4/5/6 ecological standards”, it does not mention that with a dysfunctional SCR system, the vehicles are virtually Euro 0 with uncontrolled NOx emissions. The bigger concern, as the Latin American experience shows, is that these devices are gaining more popularity in regions that have tighter standards and have introduced SCR system in diesel vehicles. It is a double whammy. While vehicle users are disabling SCR systems to avoid the extra cost of refilling urea solution, the vehicle manufacturers are increasingly finding it difficult to meet real world NOx limits or as Volkswagen has done—cheated to escape the regulations. The Volkswagen scandal shows how defeat devices reduce the severity of the SCR system and the urea dosage for NOx control. Diesel vehicles meeting Euro VI emissions standards in Europe are emitting six to 12 times higher NOx on road than their certification level. Already, the major vehicle-producing regions like the US and Europe, scalded by the diesel-gate, are framing laws to prevent and penalise the use of defeat devices in diesel vehicles. Both, the US and Europe have framed laws. The US regulation (40 CFR §86.1803-01) defines a defeat device as “an auxiliary emission control device that reduces the effectiveness of the emission control system”. Any element of design which senses temperature, vehicle speed, transmission gear, or any other parameter for the purpose of activating, delaying, or deactivating the operation of any part of the emission control system are liable for severe penal action. It prohibits the use of defeat devices. This was included in the 1975 Clean Air Act in the U.S. The US laws have slapped civil penalties as well. The US Environmental Protection Agency can levy civil penalties of up to $37,500 per vehicle and $3,750 per sale of defeat device. Such penalties have been imposed from time to time in the US. The EU framework regulation empowers the European Commission to adopt “requirements for the implementation.” It is evident from the review carried out by the International Council on Clean Transportation that the EU vehicle emissions regulation (EC 715/2007, Article 13) directs the Member States to “lay down the provisions on penalties applicable for infringement by manufacturers of the provisions of this Regulation and [to] take all measures necessary to ensure that they are implemented.” In January 2016, the Commission has received reports on penalties from only 18 of the 28 member states. These range from fines to withdrawal of type approval, recall and repair obligations, and prison. India cannot risk such cheating and worsen its public health crisis. The SCR technology for NOx control will become common place in India soon. By its very nature this control system passes on the onus of NOx control to the users of the vehicle. This system can work only if millions of operators of trucks, buses, cars and SUVs dutifully fill the urea solution regularly. To ensure this, globally, regulations require vehicle manufactures to install auto checks in the vehicle which can that sense if the urea solution has depleted and stop the vehicle automatically. But defeat devices are designed to disable this in-built check. These devices modify the system to allow the vehicles to run even if the solution is not refilled and also not let the onboard diagnostic system flash red to alert the user. Imagine what will happen in India when millions of truck, bus, car and SUV users can shop for defeat devices through the internet. Temptation will be strong enough and without regulatory action, cheating can be rampant. India urgently needs two sets of regulations—one to prevent diesel vehicle manufacturers from cheating emissions regulations; and, second to stop people from using defeat devices to disable emissions control systems when vehicles are on the road. Emission standard regulations must prohibit disablement of emission controls. The US and Europe are refining their regulations. They are bringing real world-driving requirements, improved testing procedures, regulations and penalty for defeat devices; and stringent in-service compliance regulations. Emissions will be tested even as vehicles are moving on the road. The Volkswagen scandal has shown that cheating can go undetected for a long time even when countries like the US has the world’s most stringent in-use compliance regulations and penalty. India needs a strong, independent and transparent emissions testing regime. India also needs a strong inspection regime to prevent the use of defeat devices by the vehicle users. This demands a paradigm shift in our regulations. Otherwise, the enormous investments in Euro VI technologies and fuel quality will not provide the intended air quality and public health benefits. Still, a queasy question remains. Why organised internet-based retail marketing like Amazon—knowingly or unknowingly—allow the marketing of products that fall in the grey zone? Promotion of any product that claims to disable emissions control systems to undercut emissions control initiatives for public health protection in any country is unethical. Giving such devices in the hands of the people for en masse disabling of emissions control systems will lead to serious consequences. An enabling marketing environment will only make curbing of such malpractices more difficult, in fact impossible. Marketing agencies may argue that there are no global legal filters for such products. All the more reason why this will require not only proactive and voluntary action on part of the retailers but also multi-lateral global action to check such malpractice across all markets. Otherwise, the rapidly dieselising developing world with poor policing and enforcement capacity will pay a heavy price for toxic air—more ill-health and deaths.